When Cassandra de Warenne’s sister Tracey arranges a lavish party at their English estate, she invites Antonio de la Barca, a renowned professor of history. Cass isn’t prepared for the intense and immediate attraction-an attraction that heralds something deeper, more powerful, and more perilous than she could ever imagine. For their families have been entwined for centuries, linked together by a history of horrendous heartbreak, bitter rivalry, and bloodshed that began 450 years ago, with one woman, Isabel, forsaken and betrayed by her family, her lover, and her friends. Intrigued by the prospect of unearthing more about this legend, Cassandra accepts an invitation to Antonio’s ancestral home. But soon after she and her family arrive, Cassandra discovers that Isabel is a very real-and threatening-presence. Who was Isabel, and what does she want today from Cassandra and her sister? And can Cassandra trust Antonio, a man who may be her only link to the past-and who may lead be the most dangerous man she has ever met? New York Times bestselling author Brenda Joyce weaves a spellbinding tale of love and danger that will linger long after the last page is turned. 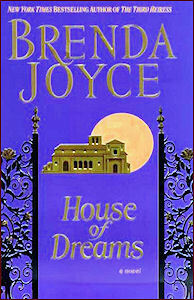 In House of Dreams, two aristocratic families, one English, one Spanish, have been tragically destined to come together time and again over centuries. Just where the hell was her sister? Cass had spent most of her life in her sister’s shadow–Tracey was one of the most beautiful and glamorous women Cass knew—and unfortunately, she had a tendency to run late. Cass was a wreck. Surely today, of all days, Tracey could be on time. Just this once. In another two hours the house would be filled with Tracey’s guests. With Forbes 400 types, their fashion-plate wives, the odd Silicon Valley millionaire, celebrities, dignitaries, the press, two Japanese bankers, a couple of rock stars, an Israeli shipping tycoon, an ambassador, and a sprinkling of dukes, duchesses, and earls. The very thought caused Cass’s heart to lurch unpleasantly. But mostly, Tracey should be on time because she hadn’t seen her own daughter in three months even if they did speak on the phone. Cass stood nervously by the window, staring past the crisply white shell drive and across the green rolling hills of the East Sussex countryside. She was perspiring. Dairy cows dotted the fields spanning the distance between the house and the small village of Belford, which she could just make out as a jumble of pale stone rooftops. The day was gray, the threat of rain imminent, reducing visibility. Even so, she could see the nearest town—Romney, famous for its tourist attraction, an intact castle dating back five full centuries—as it sat on one of the surrounding hills. Cass could also see a thin strip of highway meandering through the countryside. No car was in sight. “Where’s Mother? Why isn’t she here yet?” A small voice asked. Cass’s stomach was in knots as she turned to face her seven-year-old niece. “Your mom will be here at any moment, I’m sure of it,” she lied. And she thought, Please, Trace. Alyssa sat on her pristine pink and white bed, against numerous fluffy pillows, all beautifully embroidered and mostly pink, white, and red like the bedroom, wearing her newest clothes–a short, pale blue dress from Harrods, navy blue stockings, and chunky black suede shoes. Her raven black hair was pulled back with a tortoiseshell barrette, and her face was scrubbed and glowing. She was so pretty, but nothing like her mother–not in anyway. Alyssa nodded, but did not seem convinced. Cass knew that her younger sister was wild and irresponsible, but she wasn’t that wild, or that irresponsible. The evening affair was on account of Tracey’s new job with Sotheby’s in London. The moment Tracey had asked Catherine if she could hold an event in order to display a very rare necklace to three dozen potential buyers—the crème de la crème of international society—Catherine had agreed. Their aunt rarely refused either one of her nieces. Cass’s temples began to throb dully. Tracey would show up—wouldn’t she? Cass could not imagine helping Aunt Catherine to host this event. She was not a jet-setter like her sister. She did not frequent five-star hotels, fly first class, juggle playboys and polo players, or even own more than a single evening gown. She did not go to the weddings of supermodels. Cass’s last boyfriend had been a journalist, not a rock star. “Some people just can’t help being late,” Cass finally said, forcing a lightness into her tone that she did not feel. “It’s a terrible habit,” she added. And that much was true. Cass knew that Tracey did not mean to keep people waiting. It just happened. It was less about self-absorption than it was about disorganization and time management. No one lived life the way her sister did. Still, Cass had been filled with a growing sense of dread all that day. The evening—or her sister’s visit—was going to be a disaster. Cass had never felt more certain of anything, even if she could not pinpoint why. Cass just hoped the premonition of disaster didn’t have to do with her filling in for Tracey. “She’s so busy now with her new job,” Alyssa said, her dark eyes lowered, her thick black lashes fanning out on her alabaster cheeks. She was the spitting image of her rock-star father, Rick Tennant, who was currently on a world tour and somewhere in the Far East. Cass hoped that was so. Sotheby’s seemed like the perfect job for her sister—she could mingle with the rich and famous, while her employers benefited from her celebrity status and her celebrity associations. Since her marriage, and even more so since her divorce, Tracey had been a fixture on the society pages of most major magazines. Tracey’s marriage to Rick had been overin less than three years. Cass regretted, for Alyssa’s sake, that it hadn’t lasted. But Alyssa was the best thing that had ever happened to her, and she loved her as if she were her own daughter. In fact, sometimes she forgot that if Tracey wanted to, she could saunter into their lives and whisk Alyssa away without even an explanation. Which, of course, Cass prayed she would never do. “I hear a car,” Alyssa cried, leaping up, her entire face brightening. Cass was flooded with relief. Alyssa ran to the window, her black hair swinging like a cape behind her, while Cass hugged herself, sighing, because she would not have to play hostess and Alyssa would see her mother after what had become an interminable separation—from a little girl’s point of view. “It’s not her,” Alyssa said, her tone flat. Cass stood her heart sinking, eyes wide. “What?”Where was Tracey! Alyssa seemed on the verge of tears. Cass took one look at her pinched white face and she reached for her hand. “She’s running late. Should we take a walk? It might help pass the time,” Cass said. “I’d rather wait here. I don’t want to miss her,” Alyssa said with a stubborn tilt to her chin. Catherine slowly set the tray down on the Chippendale table in front of another set of windows, one graced by two pink velvet chairs. Although seventy, Cass’s aunt was a tall, statuesque woman who looked no older than fifty. Her reddish hair was shoulder length and worn in a chignon, and she remained extremely handsome, a perpetual light in her blue eyes. Even clad simply in gray trousers, a white blouse, and a darker cardigan, she had the carriage of a very noble, self-assured, and self-sufficient woman. Cass admired her greatly, for her character, her generosity, and the many good deeds she had dedicated her life to. “Of course she does. Our guests will be arriving at seven, and knowing your mother, who needs a good hour or two to dress for this kind of event, she will have to arrive at any moment,” Catherine said, smiling. Alyssa wandered overto the table and stared at the scones. She had been so excited that morning she had gotten sick after breakfast, and Cass had let her stay home from the exclusive all-girls school she attended. Cass blinked. She’d obviously missed that last issue. Actually, she avoided the kinds of magazines and rags her sister usually appeared in. Cass wasn’t jealous. It was just oddly hurtful to see her sister on those pages so often, surrounded by household names, looking so perfect. “I don’t know,” Cass said after a pause, truthfully. Tracey hadn’t mentioned a new lover to Cass. Alyssa bit her lip, looking perilously close to tears. “I think you should take a long hot soak, Cassandra, and spend some time primping before the mirror for this evening’s affair,” Catherine said gently. Cass caught the briefest glimpse of her own reflection in the mirror as she started and turned back to face her aunt. She was wearing not one stitch of makeup, and the Barnard sweatshirt she’d thrown on that morning was as old and faded as her jeans. Her honey blond hair was shoulder length and pulled into a ponytail. Like her aunt, she had strong, even features and good skin. Unlike her aunt, she did not turn heads. And she knew exactly what her aunt meant—she should take extra care to dress up because one never knew whom one might meet. “Moi? Primp? Would you care to define that for me?” Cass had to smile. Before Cass could accept or decline, Catherine said, “You are far too young to own, much less wear, lipstick, Alyssa.” Her tone was stern. Catherine just looked at her, her expression a mixture of resignation, reproval, and respect. Cass fled the room before they could get into an argument about Cass’s single-minded focus on her career as the author of historical novels–she’d had four works published in the past six years—and her consequent, serious lack of a personal life—or even the mere pursuit of one. Cass hurried downstairs in her rubber-soled loafers. They had been over the old tired argument a dozen times—she should get out more, date more, she should be married, she should have her own kids. Catherine just didn’t understand. Taking care of Alyssa and her work was just about all she could handle. There was only so much time in every day. A housemaid smiled at her as she hurried past, down a dim hall with stone floors, her mind torn between thoughts of Tracey’s arrival and her departure, the desire to protect Alyssa from all of life’s disappointments, both large and small, and her own inner voice, which agreed ~ with her aunt entirely. Five years ago, when she had packed up her life and moved with Alyssa from her small apartment in New York City to Belford House, she’d given up her pursuit of a personal life and hadn’t dwelled much on it since. There had been no choice to make. Alyssa had needed her from the day she was born, and the moment Tracey and Rick had decided to divorce, it had been clear to Cass that if she didn’t raise the small child, no one else would. She hadn’t had the means to be a single mother, and moving in with her aunt had been the perfect solution. There were no regrets. Cass stepped through a pair of doors that opened on one side of her aunt’s flower gardens, the driveway to her left and just within the range of her peripheral vision. She swung her head around and hesitated, noticing a black Citroen in the driveway. Her sister drove an Aston Martin. Or rather, her driver did. Tracey had made out very handsomely in her divorce settlement. It was too early for any guests to have arrived, and just as Cass was pondering that notion, she realized that someone was standing in the gardens on her right, his back to her. For one moment she wondered if he was one of the security men from Sotheby’s. He was tall, dark haired, and well dressed in tan trousers and a black sport jacket. The tan trousers gave him away as something other than security, because the security men wore all black. Cass approached, clearing her throat, about to ask him if he needed help–or was even in the right place. Cass felt a flash of recognition even before his eyes met hers. She stumbled, for one instant lost in confusion.